Oh, Seekh Kabab , this dish is very close to my heart. WHY ??? That’s because in my wedding, we had some special Seekh Rolls which ofcourse being a bride I could not try. I just kept hearing about them throughout the function. When my close friends and family were coming up to the stage to meet I was hearing things like, ” Oh you have got a nice a family, you are going to enjoy the rest of your life, ” etc and then following these lovely wishes there was something like how about the Seekh Rolls ? Do call and let me know from where did they order those. Next morning after the guests departed, in my new home, we were all opening gifts and eating the left over. I was offered the Seekh Kababs rolls finally. It was really awkward since it was my first day but then I had them and those were…just out of this world. I just had a bite and we had some neighbors coming to meet the bride. You know, in India they call it Muh Deekhayi. My Brother-in-Law literally got up and said to us (not too loudly), ” Should I tell them, that the new bride is hogging on the Seekh Rolls inside her Ghoonghat. She will come out and meet you guys once she is done.” It was very embarrassing….. they were just trying to make me feel comfortable in the new environment. What a bunch of fun loving people I live with. So that was all about how I feel for Seekh Kabab. I love them and have learnt to make them. See the quick and easy recipe. Take a bowl, add the mince chicken in it. Add sliced onion, green chilli, ginger paste, salt, corriander leaves, chicken masala and garam masala powder in the bowl and mix them well. Dampen your hands with some water. 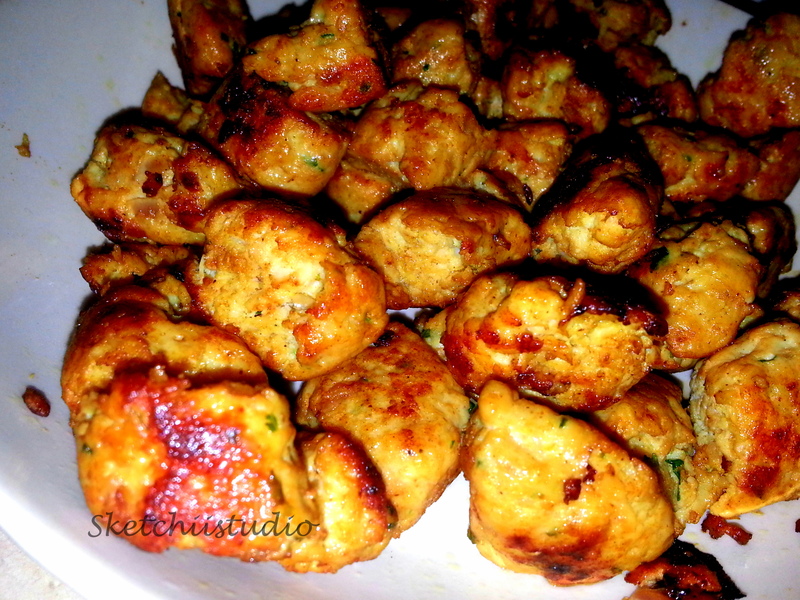 Take some portion of mince chicken, roll it into a ball shape and then wrap it around a skewer. Gently press it to make the seekhs. You may grill these in a griller, cook these in oven or use a grill pan for stove top. Oven Cooking – Place them on an oiled baking sheet, spray them with olive oil and broil them on High in your oven for 5-7 minutes on each side. Griller Cooking – Place a foil on the griller and place the kebabs. Spray some olive oil. Flip them over when these turn golden brown. On few occasions, I make these in the regular non-stick pan on stove top. Just spary some Olive oil to keep them soft. See the pics. When the rolls were half cooked I cut each roll into 4-5 pieces. Add a spoon of oil in the mixture to keep the Seekh rolls moist and soft. Make a dip. I use a spoon of mint chutney and mix it with yogurt. Add some bhuna jeera , red chilli powder and salt to it. You may add some chopped onions also. I used raw chicken and minced it in the food processor.